I find that “just print it” includes a lot of prep work for complex models. We’re not quite at the turn-key point yet. I spent hours yesterday pruning vertices on the latest and greatest. It should be ready to show in a couple of days. 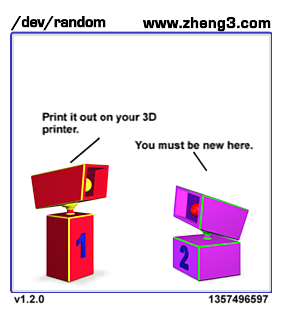 This entry was posted in /dev/random, 3D Printing and tagged comics, nerd humor, robots on January 7, 2013 by zheng3.